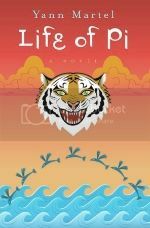 Yes yes, another book-recently-turned-into-a-movie; March's OBC book is the recently-film-adapted Life of Pi: Life of Pi is a fantasy adventure novel by Yann Martel published in 2001. The protagonist, Piscine Molitor "Pi" Patel, an Indian boy from Pondicherry, explores issues of spirituality and practicality from an early age. He survives 227 days after a shipwreck while stranded on a boat in the Pacific Ocean with a Bengal tiger named Richard Parker. Oooh I have really wanted to read this, so I think this well give me a good excuse to buy it this weekend! I haven't seen the movie either, so I'll be interested to hear what people have to say about it! Well since this is actually on my reading pile, I guess I can read it now. I too haven't seen the film, though I've heard good things. oh wow i really wanted to watch the movie, but i didn't know it was based on a book. i will have to read this book sometime!!!! I'm about 60 pages into the book now, and I have to say I'm liking it. I like how it's written, it is flowing quite well. Right now there are a few questions I want answered about the narrative structure, but I'm sure we'll get some answers when we get out of the introductory section. I quite like that Martel doesn't seem to promote one religion, since Pi practises Hinduism, Islam and Christianity, which I think is very interesting. He points out the similarities, and also the difficulty of inter-faith practise, as the three religious leaders don't like the fact that Pi is not a plain and simple Muslim/Hindi/Christian. So I was alright with it all, up until we had that scene where Pi was blind and there was the other guy and then he was killed by Richard Parker. Then we had that really weird time on that island of algae that ate people, THAT WAS SO WEIRD, but it was kinda cool cause I knew something weird was going to happen just because it felt that way. Then came the ending and the talks with the Japanese guys. They didn't believe Pi's story so he told an alternative one, and then it crashes down on you, which one was true. Was the one with the animals true, or the one with the people. And I felt so disappointed because we just read through this entire story and then it could be wrong. I just don't like that, it makes me feel annoyed and 'cheated'. It was up until that point I didn't really see what the big fuss was about and why it was a literary novel. Edit: I just have to say that this ending reminds me of all those stories that end with "And then I woke up", really that's how I feel about the end! I'm going to be really interested to see this as a film, when it comes out on DVD, cause I've missed my chance to go and see it in cinema. I did like the novel, but the ending really left an unpalatable taste. Edit: I'd actually suggest that people read parts 1 and 2, and forget part 3 even existed, part two ends well enough, and part three will just disappoint.